Mahalo for visiting our Job Center! Whether you're looking for a new opportunity or just looking to provide an opportunity with your organization, we hope you find it here. To view the full details for each listing click on the job title. **You are on a local AFP chapter website not the AFP IHQ Career Center. Positions posted here will ONLY appear on this site, and vice versa for AFP IHQ. If you wish to post to the national career center, please visit AFP IHQ Career Center. 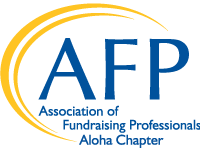 Mahalo for sharing your job posting with the AFP Aloha Chapter network! A benefit of membership is first notification of jobs before the general public. After payment and materials are received, jobs are posted on the Aloha Chapter job center within 24 hours. Members are then notified through our weekly Job Posting Email to contact or share with associates. We also list the most recent job postings to our monthly newsletter, The Mentor, where the public network is notified. The listing is posted for 60 days unless otherwise advised. The same nominal fee applies for re-listing. While not required, we request that the organization share the final name, picture and title of the hired candidate so that we can close the job posting and congratulate the new professional in our weekly newsletters. To post a job posting on our job board we require all postings be sent to admin@afphawaii.org in PDF format. Payment confirmation must be received before the post is published to our site. Visit our Cvent registration page by clicking the "Pay Now" button below and register to make payment by credit card. Membership is determined by the AFP Aloha Chapter office. If an individual of your organization is a member, your organization -- for the position announcement service only -- is considered a member. You may pay by online credit card processing. *Important* Your job announcement will not be posted or sent to the Membership via e-mail until receipt of payment and required information for the job posting. Paid position will be posted within 24 hours.